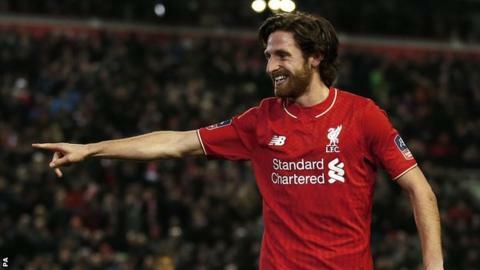 Wales international Joe Allen should stay and fight for his place at Liverpool, former Reds midfielder Ray Houghton says. Allen, 25, has 18 months left on his current deal and says he is playing for his Anfield future. Liverpool recently rejected an enquiry from Swansea City about re-signing their former midfielder on loan. "I'm not sure he's going to get a bigger club than Liverpool, so why leave?" Houghton said. "I think you've got to force the issue whilst you're here and when your chance comes, take it. "The manager will be looking at the ones he wants to keep." The Welshman scored the decisive kick in the penalty shootout against Stoke City which secured Liverpool's place in the Capital One Cup final on Tuesday. This month, he also scored a last-minute leveller which grabbed them a point in the Premier League against Arsenal and scored against Exeter in the FA Cup. But he has started only one Premier League game since Jurgen Klopp was appointed manager in October. Klopp succeeded Brendan Rodgers, who brought Allen to the club from Swansea in a £15m deal in August 2012. Rodgers' former assistant Colin Pascoe believes Allen has a future at the club following his recent performances. "I thought he turned the game when he came on [against Stoke]," Pascoe told BBC Radio Wales. "He's a fantastic player and hopefully he'll get more starts. "As any player, you want to be loved by the manager and show that he trusts you and he wants to pick you, week in week out. "He's fiery, wears his heart on his sleeve and he wants to do well."